Sunday 23 April. Chichester Start to the Elephant and Castle, West Chiltington. With light rain all morning it was no surprise that only one, Anne Kelly joined me on the ride from Chichester. We made good time riding via Pillygreen, Upwaltham, Duncton Hill and Sutton to stop for elevenses at The Barn by the Willow Cafe, Bury. We continued via Fittleworth and Coldwaltham to West Chiltington arriving at 12.10. Members of Horsham Section were already there soon joined by Arun Adur members. Shortly after our Walberton Pond start ride arrived led by Phil and Mary with a better turnout with Gill, Bruce and Alan and Liz. 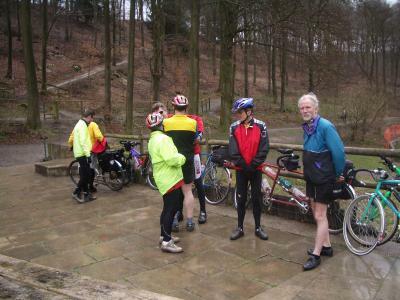 After lunch all Sections rode for a couple of miles to the freewheeling hill. 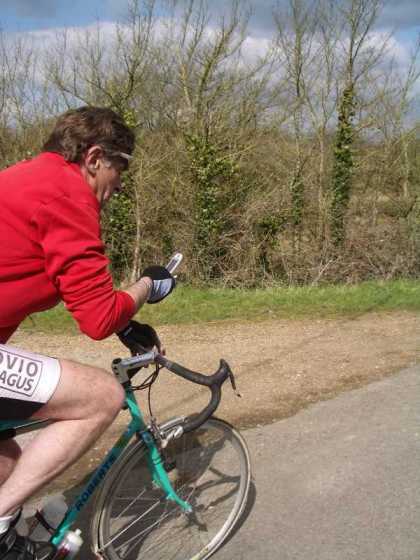 I set people off at the start and Dave Galle checked how far they went at the bottom. Barry Deacon went the furthest and Nicola Yerrell went the furthest out of the ladies. 20 took part in all. From the finish the various Sections went back on different routes and our group headed back with a stop for tea at Houghton Bridge. Sunday 17 April, Ride To The Unicorn Pub, Heyshott. The weather today was warm, muggy and overcast, with occasional bright spells when the sun broke through the clouds. Harvey, Ann, Gill and a new member set off from the Chichester Cross and made their way to Compton along minor roads where they had elevenses at the village store there. 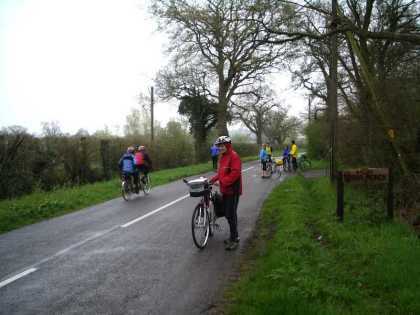 They then headed via South Harting & Cocking to Heyshott for lunch at the Unicorn, where I met up with the group having cycled there straight from home. We spent a pleasant hour eating lunch in the garden. Whilst we were doing this we noticed that dozens of tiny black insects were crawling over our fluorescent clothing, presumably under the impression they were some sort of flower! After lunch we set off east along minor roads through Graffham and meandered through the grounds of the Bletchley Park like Seaford College. We then changed direction and headed up Duncton hill and then via East Dean & Charlton to West Dean garden centre, where we had afternoon tea. After tea here we all dispersed and made our own ways to our respective homes. My mileage at the end of the day was 105km. Monday 17 April, New Forest Weekend. Weather today was bright and sunny in the morning with more cloud in the afternoon. Temperatures reached 15C. The original plan for today was to return on the Hythe ferry to Southampton. However we decided to avoid the urban sprawl by getting the Lymington Yarmouth ferry to the Isle of Wight, then cycling along the NW side of the Island via Cowes and getting the Fishbourne to Portsmouth ferry. 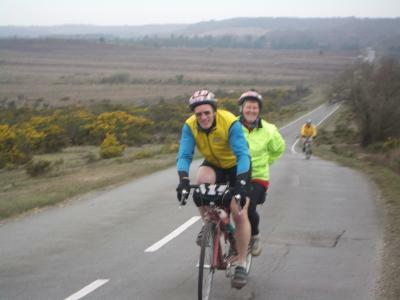 We started the day with a 10 mile ride to Lymington on lanes. Just outside Burley we were held up briefly as a Film Crew filmed a short scene at the side of the road. Then on to Lymington in time for a ferry 15 minutes after we arrived. 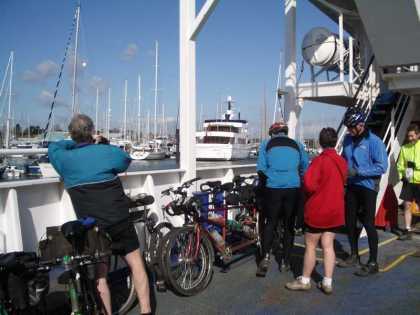 We had elevenses on the ferry and then cycled on the round the Island route to Cowes and over the Chain ferry arriving just as a ferry came in. We continued to Fishbourne arriving again just as a ferry was docking. We congratulated John on his organizing. Lunch was taken on the ferry which was a smart new one. After the 45 minute crossing we cycled on the cycle route to Cosham and then across to Havant and a stop for tea at the Greenhouse Cafe, Emsworth. 3 of us ordered a very delicious caramelized Apple Pie with ice cream recommended by Phil. Sunday 16 April. New Forest Weekend. Today weather was cloudy early on soon clearing to bright sunny spells and then clouding over again in the afternoon. 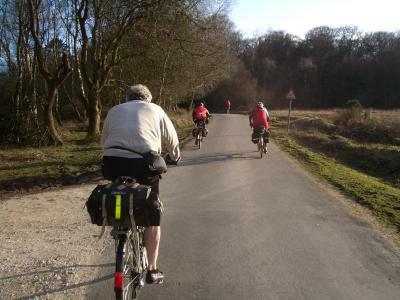 Our ride was in the NW area of the New Forest and probably 70% of it offroad on Forest cycle tracks. With a lack of tea-rooms in the forest we stopped for an elevenses break on some logs and enjoyed some Easter Eggs supplied by Mary. We continued up to the Hampton Ridge track and a steep climb up to earn some great views and then down to lunch at Frogham. A track later in the afternoon produced a puncture for Phil and Mary immediately followed by another puncture for Sam. The total for the trip for the group was now up to 8. Afternoon tea was taken back at Burley. Mileage for the day was 36. Today's weather was generally cloudy with light rain in the afternoon. Our ride was mainly on some very good cycling tracks on forest trails. John led us on some tracks near Burley to start with with a few comments from the peleton about going round in circles. Then on an old railway cyclepath to Brockenhurst and a stop for tea. 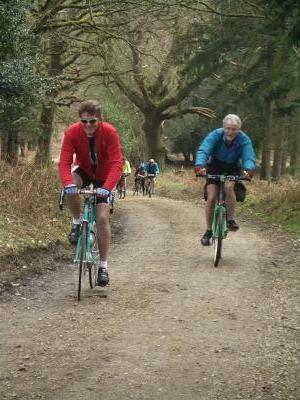 Then on to East Boldre near Beaulieu well known among cyclists for its giant sized portions. We all overate at lunchtime. More tracks in the afternoon and on to a tea-rooms near Burley for tea. I had 2 punctures during the day and Richard one. With my tyres well worn I decided to buy new tyres at the bike shop in Burley. Mileage for the day was 39. 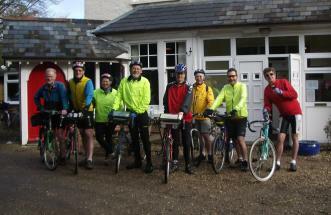 8 of us met at the Cross for the trip organised by John Maxim to the New Forest. Myself, John, Colin, Sam, Phil and Mary and Richard Boulton and Peter Wilson from Arun Adur. We took lanes via Rowlands Castle to stop for elevenses at Queen Elizabeth Country Park. Then the long climb to H.M.S Mercury and a short sharp shower while riding along the ridge. More lanes across to Bishops Waltham and a brief lunch stop. Then a back route north of Romsey and a stop for tea and some substantial refueling. Then SW into the New Forest and the usual Cattle Grids and loose ponies. Weather was brighter as we took a 5 mile track down to Burley and the Youth Hostel. glorious and we had a great ride.